Using the predictive model I’ve built, powered by the latest World Football Elo Ratings, I’ve simulated the rest of the matches in each group 100,000 times. I’ve split the results into nine different ‘buckets’: one for each of the possible combinations of results from the next two matches in that group (e.g. home win in match 1 and draw in match 2 etc). For each of these nine scenarios, I’ve calculated the percentage of times that each team goes on to finish 1st or 2nd in the group. The graphic lays out the nine scenarios in a 3×3 grid, with each of the nine ‘squares’ showing the breakdown of probabilities. 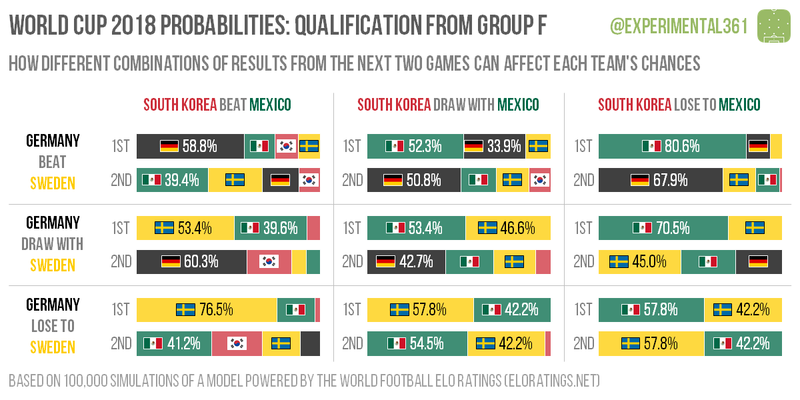 Starting in the top left, what this is saying is that if Germany beat Sweden and South Korea beat Mexico, then Germany would be favourites to top the group with a 58.8% chance. The chart beneath that one shows that if Germany can only draw but South Korea win, then they’d still be likely to claim second place – this is due to how heavily fancied they’d be to beat the Koreans in their final game. The absence of black in the bottom middle and bottom right charts is basically saying that it’d be all over for Germany today if they lost, unless South Korea were to beat Mexico (which would see them retain a slim chance of qualification going into their final game). As the rightmost column shows, a Mexico win would make them favourites to win the group whatever happens in the other match. If they fail to win, then a Sweden victory today would see the Scandinavians installed as favourites to top the group. South Korea have to play for a win today, but regardless of the other result they’ll need some luck in the final round of matches. As you’d expect, an England win tomorrow will only install them as group favourites if Belgium fail to beat Tunisia today. If both teams win, then the Belgians’ superior goal difference from their first match tips the scales roughly 60:40 in their favour going into the final round of fixtures. 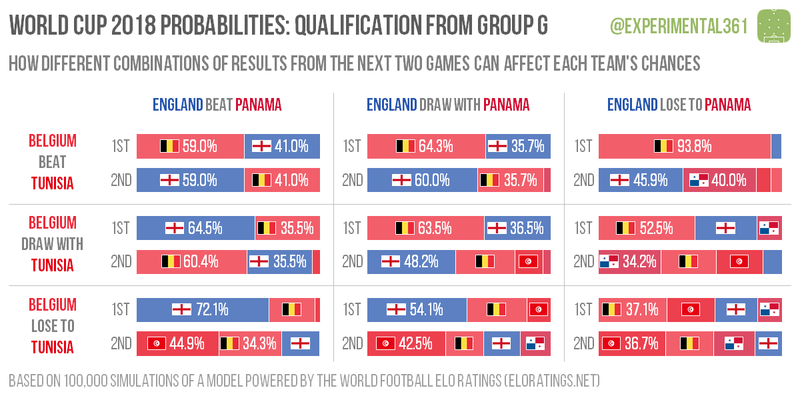 In the unlikely event that Panama win, then a Belgium win pretty much hands them first place and leaves England scrapping for second place. Tunisia‘s best hope is that they can stun Belgium while England stumble, as this would put them right back into the mix. The best case scenario for Japan is that Poland and Colombia draw, as this would make them almost certain to top the group with a win over Senegal. The same goes for the African side should they record a victory tomorrow: a win for either team in the other game would erode their advantage. 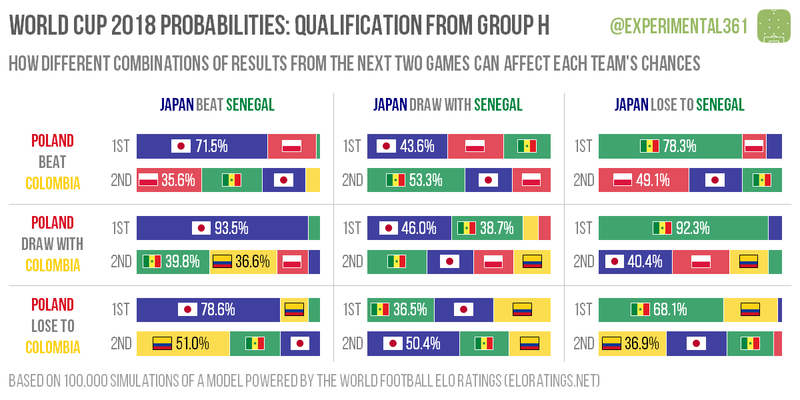 If Colombia think they can beat Poland then they should be rooting for Senegal in tomorrow’s earlier fixture, as a Japan win would make it tougher for them to bounce back and top the group. However if the Colombians fail to win then it’s better for them that Japan do well, as this gives them a better chance of sneaking through in the last round of games. For Poland the picture is also complex, with a draw in the other game maximising their chances of topping the group. If the Poles lose again then their only hope is for Senegal to win, as this preserves a slim chance of them scraping into second place (this would require Senegal to win their final game too, which combined with a Poland win would leave the other three teams level on points and separated by goal difference).